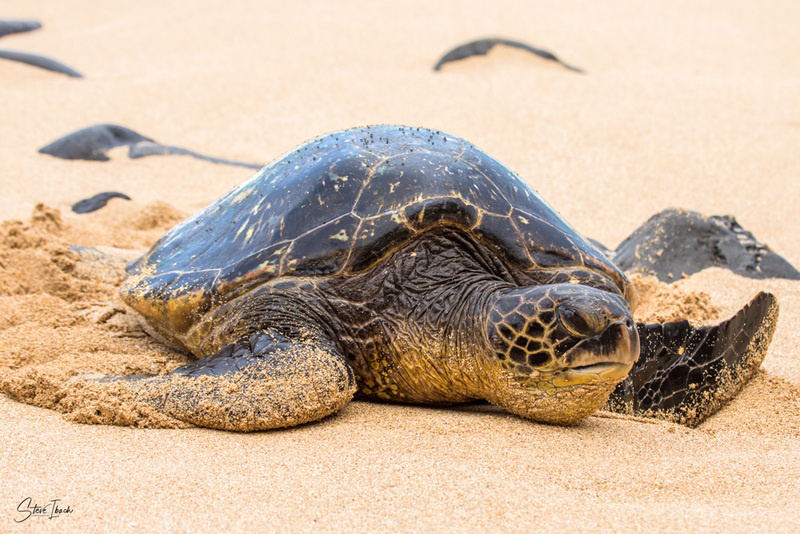 The honu, or Hawaiian green sea turtle, is a sacred and beautiful animal found in Hawaii. Honu symbolize good luck, safe journeys, endurance and good health. Honu are mentioned in ancient Hawaiian chants and their images are found in petroglyphs throughout the Hawaiian Islands. Honu can be up to five feet in length and weigh hundreds of pounds. They can hold their breath for hours in the water but like to spend time resting and basking on the beach as shown in this classic photograph. Honu are a genuine symbol of Hawaii.